How did we become the Phoenix? 1970 – As UW-Green Bay prepared to graduate its first class of seniors and conclude its first year of intercollegiate competition, it was decided to cut the cord with the flagship parent campus in Madison and adopt our own emblem. UW-Green Bay decided to send the water-skiing version of Bucky Badger on a permanent vacation. The Fourth Estate printed a poll that gave the students the opportunity to vote for the new University mascot. The choices ranged from the UW-Green Bay Loggers, Eco-men, Beavers, Voyageurs, and even the Fighting Tomatoes. Other suggestions were related to environmental themes, due to our environmental reputation. 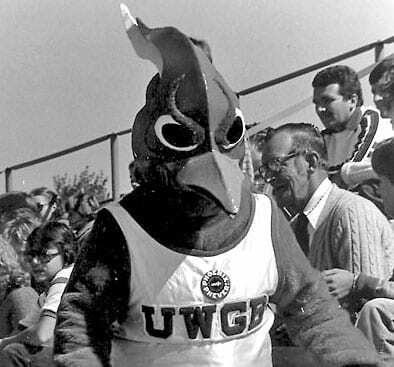 A favorite bit of early UWGB lore is that massive vote fraud pushed the off-beat entry “Tomatoes” to a first-place finish. The newspaper’s editor, Patrick Madden, class of ‘71, even confirms that version. According to legend, the Phoenix lives for a 500-1000 year cycle, and when death approaches, the bird builds a nest, the nest is ignited by the sun, and the flames engulf the bird. From the ashes, the Phoenix is reborn to live anew. Emerging from the ashes, the phoenix symbolizes rebirth or regeneration. The flame used in the design can be interpreted as the flame of knowledge and of regeneration. The symbol emphasizes the singular closeness of campus and community; faculty, staff, and students; and teams representing the University. For decades, UW-Green Bay was the only NCAA Division 1 sports program with the nickname “Phoenix” until a few years ago when D-1 newcomer Elon College in North Carolina decided to also adopt the nickname “Phoenix”. At the small-college level, Swarthmore College and Wilson College have also jumped on the Phoenix bandwagon.